Despite an anti-piracy group blundering through an investigation and breaking the law in the process, the administrator of a BitTorrent site has been ordered to pay compensation to rights holders. Jonas Laeborg, the operator of the EliteBits private tracker, was found liable for contributory infringement and ordered to settle to the tune of $18,500. Better known online by his none-too-cryptic nickname ‘Laeborg’, Denmark-based Jonas Laeborg had quite a surprise in January 2010. In a visit to his home at 7:00am he was greeted by bailiffs and representatives of anti-piracy group Antipiratgruppen who wanted to know all about his connections with a well-known private BitTorrent tracker. 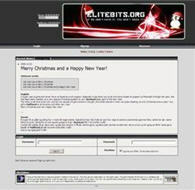 Laeborg was the admin of EliteBits and this week the 19-year-old’s work there cost him a considerable amount of cash. Despite him being “a poor student” the Court of Kolding ruled that Laeborg has to pay compensation to rights holders totalling $18,500. “We are obviously happy because the judgment emphasizes the gravity of what is happening on such a service,” said Maria Fredenslund, lawyer for Antipiratgruppen. “When you establish and operate a service in order to share movies and music that you do not have the rights to, then you are obviously responsible for what is happening,” she added. The compensation amount payable by Laeborg could’ve been a lot worse – rightholders wanted nearly $300,000 – but due to Laeborg’s financial circumstances the amount was reduced. Interestingly, though, the court also had difficulty assessing exact rightsholder losses, but not for the usual reasons. The judge said that since he could not assess the quality of the movies being offered via the site – including whether or not they possessed Danish subtitles – it was difficult to know whether to award full compensation for each piece. The implication here is that the lower the quality of the product shared, the less compensation rightsholders should get. Fredenslund says that the reverse should be true, that rightsholders should get more money when people share poor quality product. Despite the positive outcome in the case for Antipiratgruppen, the anti-piracy group and bailiffs made significant errors in their investigation. Laeborg’s lawyer, Per Overbeck, said that when bailiffs and lawyers arrived at his client’s home in January 2010 they correctly asked him if he wanted a lawyer. However, without waiting for one to arrive, they wrongfully began their questioning of the then 18-year-old. “So they began to interrogate him, and they should not have done,” Overbeck told Comon. Making the situation worse, bailiffs then stood by while Antipiratgruppen, a private company, went through and seized Laeborg’s personal possessions. “The bailiff made a mistake when they let Antipiratgruppen lawyers collect evidence instead of the bailiff’s IT experts. It’s computers, floppy disks, DVDs and the like. They should not have done so. It’s illegal,” Overbeck explained. Furthermore, Antipiratgruppen are still illegally in possession of Laeborg’s property. “For more than a year they have had his stuff. It is not legal,” said Overbeck.